Professional baseball is comprised of legendary tales, including some that contain at least a little bit of truth. For as long as he can remember, J.D. Martinez has heard the stories, which seemed to grow the closer he came to making his lifelong dream of playing for pay a reality. Eleven months into his pro career, Martinez has come to realize that he, too, can play the game against others who may have received a little more hype during the early stages of their days on the diamond. 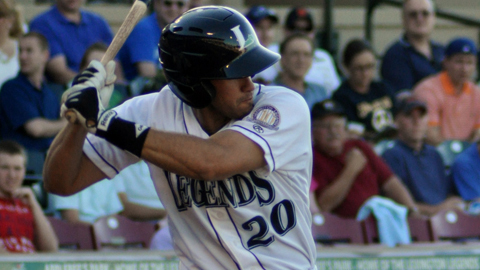 After all, the Lexington outfielder already has a league batting title under his belt and is currently making a smooth transition against a higher level of competition in the South Atlantic League. "I didn't really know what to expect last year when I signed," Martinez said. "I was coming from a Division II school, and I was just hoping I'd be able to compete with some of these guys who were coming out of the big schools. Once I realized I could compete, I started hitting the ball." After an impressive debut last year in the Appalachian and New York-Penn Leagues, Martinez has been hitting the ball as hard and as consistently as anyone in the Sally League. The 22-year-old outfielder has put together perhaps the best all-around season in the league thus far, ranking first with a .353 batting average and second with 31 RBIs. He also paces the circuit with 48 hits and 30 runs scored, stands seventh with a .551 slugging percentage and 10th with a .403 on-base percentage. Suffice it to say, Martinez has proven he can play with the big boys. Martinez was drafted in the 36th round by the Minnesota Twins in 2006 out of Flanagan High School in Pembroke Pines, Fla., but opted to attend college at Nova Southeastern University. For three seasons, he terrorized opposing pitchers and capped his career with one of the best campaigns in school history. As a junior, Martinez batted .428 with 15 homers and 57 RBIs while establishing the single-season school record with 73 runs scored. He also established the NSU career home run mark, all of which led to a first-team All-America recognition at the D-II level. "I feel like I matured a lot while I was in college," Martinez said. "I also saw a lot of off-speed pitching. We didn't face a lot of guys who could throw really hard, so that forced me to learn how to hit off-speed pitching. I could always hit fastballs, and I seemed to struggle in high school against breaking balls and changeups. By making that adjustment, I feel like I became a better player." His performance notwithstanding, Martinez received tepid interest from the professional ranks before the Astros nabbed him the 20th round last June. Determined to reward Houston for the team's faith in his abilities, Martinez dominated the Appy League at Greeneville with a .403 average, five home runs and 23 RBIs in 19 games. He was promoted to Tri-City in the New York-Penn League on July 12 and proceeded to pace the short-season Class A circuit with a .326 batting average. He qualified for the crown on the next-to-last day of the slate and finished with 61 hits in 53 games. "I felt like I had something to prove last year because I was drafted late," said Martinez, who also ranked third in the NYPL with seven homers. "I know I have to continue to put up numbers to become a prospect in the Astros' eyes. I think the way I've been playing, they're thinking I might be for real and that they should keep an eye on me." Martinez has heard the stories regarding how difficult it can be for players to remain productive from start to finish in their first full professional season. He admits he has tried to pace himself in the first month of the slate, but knows there is really no way for his body to anticipate the daily pounding it will continue to take as the year progresses. Yet even with the constant challenges he's facing at Lexington, Martinez's easy smile reveals there is nothing he would rather be doing. "The weather has been a little cooler at times than I expected, but other than that, I knew I would be playing against better players, which meant the speed of the game would be even faster," Martinez said. "But it's still baseball. The pitcher has to throw the ball across the plate and I have to hit it when it gets into my zone. I love playing this game, so right now life's pretty good." Providing a boost: Rome received some much-needed offensive assistance when OF Robert Hefflinger was promoted from extended spring training in late April. Hefflinger is second in the league in hitting thus far in May, batting at a .419 clip (13-for-31) to go along with nine RBIs. The R-Braves rank 13th in the 14-team league with a .232 batting average. Hot 'Dog: After hitting .236 in April, Charleston's Jimmy Paredes has caught fire in May. The second baseman owned a .381 average over his first 10 games of the month, including five multi-hit outings. Paredes went 4-for-5 with three stolen bases and two runs scored in the RiverDogs' 5-3 victory over Delmarva on May 9. Ups and downs: Entering his start last night, Augusta's Zack Wheeler had not allowed an earned run in his previous 9 2/3 innings. But the Giants' first-round Draft pick in 2009 got roughed up Wednesday, yielding six runs on six hits in 2 1/3 innings. Bill Ballew is a contributor to MLB.com. This story was not subject to the approval of the National Association of Professional Baseball Leagues or its clubs.